What signs and symptoms can you expect? 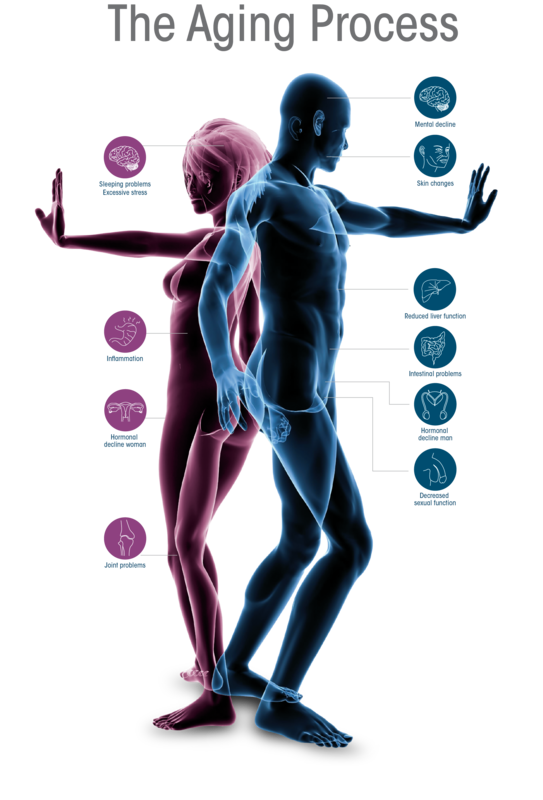 Hormones influence a variety of processes in the human body. The production of the female hormone oestrogen declines during menopause. In men, testosterone production declines by an average of 1-2% per year. The degree to which thyroid hormones influence different cells also decreases with age. A reduction in these anabolic hormones (hormones that stimulate the production of new tissue) tips the balance in favour of catabolic hormones (hormones that regulate metabolic processes). Sexual activity also decreases with age. Testosterone levels in men decrease, leading to a decline in sexual function. The aging process can sometimes put a strain on the heart. Changes in blood flow can compromise the oxygen supply to the heart muscle. The vital capacity of the lungs also decreases with age. The VO2 max (maximum oxygen consumption per minute) decreases as we get older. Common environmental and behavioural factors like air pollution and smoking influence this. Striking a healthy work-life balance is becoming increasingly difficult in today's world, particularly when faced with constant stimuli in the form of television, tablets, phones and computers. Approximately 35-40% of the population has difficulty falling asleep or staying asleep. dream sleep, also known as REM sleep We experience several sleep cycles during the night, transitioning to and from deep sleep and REM sleep. As we get older, we experience a decrease in sleep duration. Moreover, our deep sleep stages decrease as our superficial sleep stages increase. The quality of sleep is often compromised by things like getting up to use the bathroom. Healthy sleep tends to be underrated in today's society. We are going to bed much later due to busy social schedules, work stress, caring for children and distractions in the form of television and social media. These stressors are also keeping us awake for longer. Poor sleep quality means the body doesn't have time to repair itself. It also leads to fluctuations in circadian rhythm, resulting in poorer performance during the day. Did you know that healthy sleep patterns and dreams can improve academic performance and memory? Changes in blood flow can compromise the oxygen supply to the brain. A lack of oxygen and nutrients can result in concentration problems and forgetfulness. It can also influence academic performance and lead to mental decline in the long term. Bone calcium levels decrease with age, which leads to brittle bones. As a result, older people tend to have longer recovery times following a fracture than children and young people. Bone changes like these increase as we age. In women, hormonal changes during menopause play an important role. Many people spend a lot of time indoors. As a result, they produce less vitamin D and are more likely to develop joint stiffness. Impaired bowel function is a relatively common symptom of aging. This can lead to insufficient absorption of nutrients. Not exercising enough, not drinking enough water and not eating enough vegetables and fibres can contribute to impaired bowel function. Extensive research has been done on leaky gut syndrome, which makes it hard for intestinal flora to do their job. There are two phases of liver detoxification. In the first phase, harmful substances like medication, alcohol and certain food ingredients, are converted into less harmful substances by a group of enzymes known as Cytochrome P450 complex. This happens through a cascade reaction. The second phase involves conjugation, whereby harmful substances bind to amino acids like glycine and cysteine. This binding process makes the complex water soluble, allowing it to leave the body through urination. Liver function naturally decreases with age as harmful substances are not broken down as quickly. Certain medications can further decrease liver function, as everything is broken down by the same enzymes. A common sign of liver impairment is a decreased ability to tolerate alcohol. Inflammation is an exaggerated immune response which increases as we age. This response is characterised by elevated levels of antibodies in the blood. Inflammation has an influence on all bodily processes. A healthy lifestyle can help to boost the immune system. The skin is our largest and most visible organ and tends to show the first signs of aging. Prolonged exposure to sunlight (UV light) and smoking play a significant role. Skin loses elasticity and volume as we age, leading to visible wrinkles. Elastic fibres in the skin are bonded by sugar, causing the skin to sag and become rougher the older we get. Pigmentation is another common sign of aging.